John Burt’s season never ends. 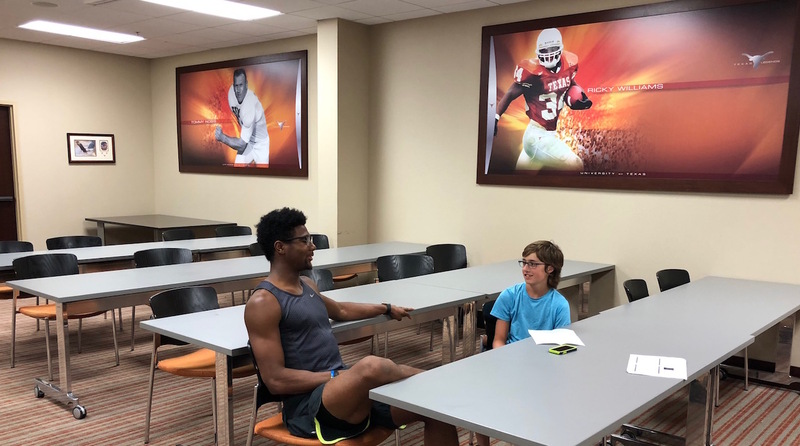 A senior at the University of Texas, Burt not only stars for the football team as a wide receiver, but he also runs hurdles for the track team. He’s been successful so far—he’s made it to the NCAA outdoor track and field championships three consecutive times and has thrived despite a change in coaching midway through his college football career. Even Burt admits that at times the schedule is challenging. Following the football team’s Texas Bowl win over Missouri in December, Burt arrived back in Austin on a Sunday. Where was he on Monday? He was at the track already preparing for the upcoming season! It might seem crazy, but this is exactly what it takes for Burt to excel as a two-sport athlete on the collegiate stage. Sports have always played a role in Burt’s life. At the age of five, he was already on the field, playing flag football. In middle school, he made it to the state track meet. As a freshman at Lincoln High in Tallahassee, Florida, Burt played football and ran track—and played baseball and basketball. However, going into his junior year, Burt was encouraged to make a tough decision. Throughout the recruiting process, Burt had told coaches that he was going to attempt two sports in college, no matter how challenging it was. “When I was being recruited, I made it pretty clear up front that I intended to run track along with playing football,” he says. He’d had lots of practice, considering he played multiple sports throughout high school, but at UT it would be more challenging. The classes would be harder, his coaches would need him to be devoted to one sport even while playing another, and time management would be vital in order for Burt to continue in the two-sport role. His focus paid off. That June, he appeared at the NCAA outdoor track and field championships, the first of three trips so far during his college career. The game ended up going into double overtime and finished with Texas quarterback Tyrone Swoopes going up and over the goal line, denying Notre Dame’s defense a goal-line stand and giving the Horns an upset win. “It was a wild game,” says Burt. That winter, Burt had yet another challenge thrown his way. Football coach Charlie Strong was fired, and he was replaced by an up-and-coming coach named Tom Herman. The coaching change meant that for Burt and the rest of his teammates, spring practice would be harder than usual. They’d have to learn a new play book and get used to Herman’s style. This change meant that for Burt, track would need to be put on hold so he could fulfill his responsibilities as a wide receiver. “I didn’t necessarily want to leave track,” he says. “It was a mutual decision that I would hold off running track until after spring ball so I could learn the system and get acquainted with how everything now worked.” After spring football season was over, the track team still had a couple more meets, so Burt laced up his spikes and raced his way to Eugene, Oregon, where he competed at his second NCAA outdoor championships! 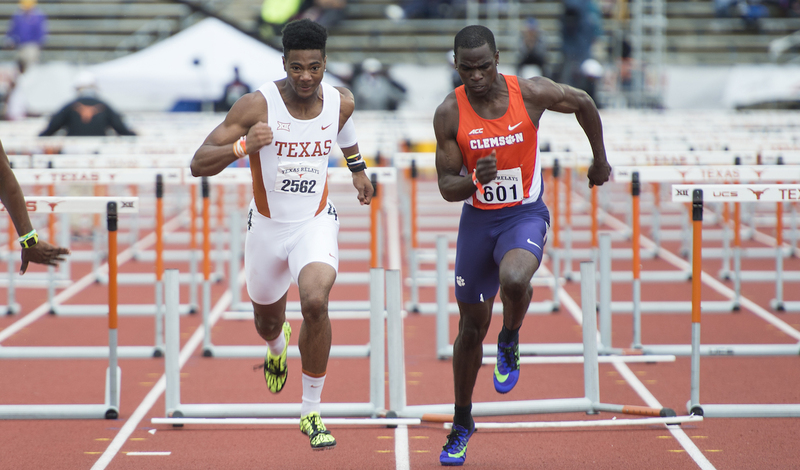 He placed 17th overall in the 110-meter hurdles. Although his junior year of football had its challenges, Burt was able to see the positives throughout the year. After all, he got to play in his first ever bowl game and scored a touchdown in the 33–16 win over Missouri in the Texas Bowl. In addition, he set a school record for the longest non-touchdown scoring reception with a 90-yard catch against Oklahoma State. He also had a tremendous year on the track in both the indoor and outdoor seasons. At the New Mexico Collegiate Classic in February, he ran a personal best time of 7.81 seconds in the 60-meter hurdles. He finished first in that event at the Texas A&M Quadrangular and was named a first team All-America after finishing eighth overall at the NCAA outdoor championships in June. Coming off impressive season in both sports, Burt has confidence heading into his senior year. 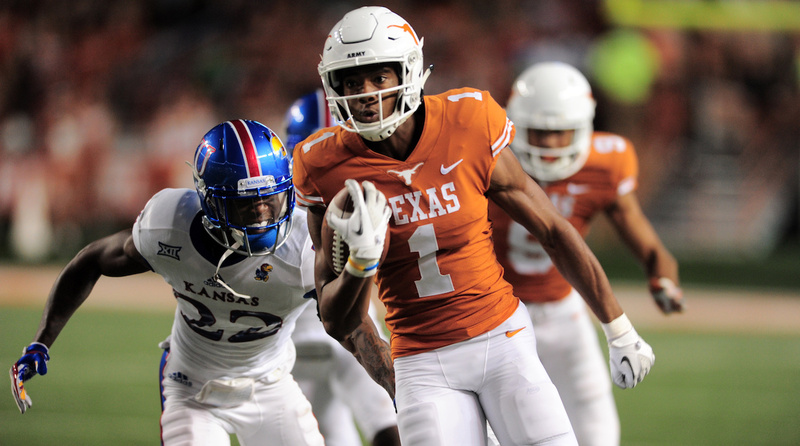 His longtime mentors, wide receivers Lorenzo Joe and Dorian Leonard, have graduated, so Burt will step into the role of a leader for the younger players on the team, showing them the ropes and helping them understand the tradition of Texas athletics. Heading into his senior season, Burt has a lot going for him. The football team should have a chance at the Big 12 championship crown, his track career is on the way to taking him to four straight NCAA outdoor track and field championships, and he will graduate in the spring with a degree in communication and leadership. Burt is a talented athlete, but what makes him stand out at this level is his ability to handle two sports and school with success.